HDMI stands for High Definition Multimedia Interface. It is a digital video and audio carrying connector that mandates HDCP copy protection. 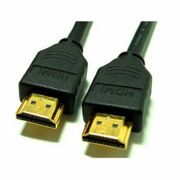 It is backwards compatible with DVI, meaning that you can input a DVI source to a HDMI capable display with the appropriate DVI to HDMI cable/adapter. * = 36-bit support is mandatory for Deep Color compatible CE devices with 48-bit support being optional. ** = CEC has been in the HDMI specification since version 1.0 but has only begun to be used in CE products with HDMI version 1.3. *** = Large number of additions and clarifications for CEC commands. One addition is CEC command allowing for volume control of an AV receiver. **** = Playback of SACD may be possible for older revisions if the signal source (such as the Oppo 970) converts to LPCM. For those receivers that have only PCM DAC converters and not DSD, this means that no additional resolution loss occurs. ***** = Even for audio bitstream formats that a given HDMI revision can not transport, it may still be possible to decode the bitstream in the player and transmit the audio as LPCM.